Prepare your home for the holidays with this classic Portland Fir Christmas Tree. The warm glow of the tree's clear mini-lights glow brighthen up your home, putting all friends and family in the jolly Christmas spirit. Each light on the branches of the tree are hand-placed to ensure a balanced, twinkling look from all angles. 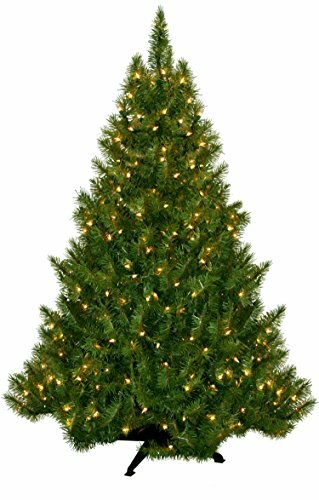 This pre-lit 450 incandescent light tree is easily assembled; just place together three hinged-branch tree parts, plug-in extensions to a standard 120v plug and mount in the included 4-leg base. The tree's branches are beautifully manufactured and strong enough to hold up decorative tree trimmings and ornaments, while also leaving plenty of room under the tree for gifts. Even if a bulb burns out, the tree will remain lit and for your convenience we provide an extra 0.4-watt bulb. At the close of the holiday season, the tree is easily packed up and stored, ensuring years of lovely memories gathered around the family Christmas tree. General Foam offers a standard 2-year warranty on all trees. This tree built measures at 6.5 feet tall and is 48 inches wide at its widest point. The tree is manufactured in North America and the boxed dimensions are 55.5 inches L x 19 inches W x12.5 inches H.